EqualityCon 2016, hosted by Equality Illinois Institute, on May 13-14, 2016 at the University of Illinois at Chicago, brought together advocates and experts to discuss the state of LGBT issues and how we can advance the cause UNTIL WE’RE ALL EQUAL. We discussed issues ranging from the federal Equality Act with chief sponsor Rep. David Cicilline and Rep. Jan Schakowsky to employment, adoption, gender diversity, racial justice, trans advocacy, faith, the rural experience and aging. 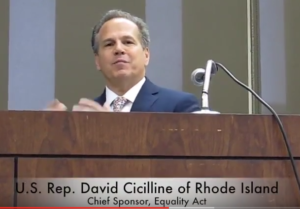 Rep. David Cicilline of Rhode Island was the opening keynote speaker discussing his sponsorship of the federal Equality Act. Click below to watch his remarks. Here are some of the other speakers and panels featured during EqualityCon 2016. Great discussion at ‪#‎EqualityCon‬ about the intersections of labor rights and LGBT rights and why coalitions are so important to advancing social justice and equal rights initiatives – with representatives of Local 881 UFCW and SEIU Healthcare Illinois & Indiana. Without having dialogue, we’re not connecting – truth! Challenging cultural norms while discussing gender diversity & youth empowerment. How does the every day person make a difference with the budget situation? According to our elected officials: SHOW UP! Thanks to two champions of equality, US. Rep. Jan Schakowsky and Congressman David Cicilline, who is chief sponsor of the Equality Act, pictured with our Michael Ziri (on left), for helping to make the first day of EqualityCon 2016 hosted by Equality Illinois Institute such a success. We received an update from the federal panel. Intriguing question was just posed to the panel regarding the numerous religious freedom laws introduced over the past year.